It's a bit disorienting to see the American League East standings with the hometown Rays on top of the heap instead at the bottom. So today I journeyed to the Dome to catch our first-place team and the Rays did not disappoint. They scored two runs in the bottom of the first inning and didn't let up on the gas pedal as the Rays cruised to an easy and thankfully undramatic 10-4 victory over the Birds of Baltimore. In other words, enjoy those free Dunkin' Donuts Monday -- they're on the house because the Rays won today. Monday is an off day, then the Yankees come to town Tuesday, Wednesday and Thursday. Today, the Orioles were toast. The view from down the leftfield line. Sunday is family day at Tropicana Field, which means clowns working the joint. The Trop is still a sterile dome stadium. But the Rays management has done as much as it could to doll the place up, including some cool comic-style artwork that was painted on the once-drab walls inside the place. My favorite was the Tom Seaver and Miracle Mets of 1969 panel. The Mets used to train in St. Petersburg in the spring. Nice to see how small a Hummer is. Outside Panera Bread on Bruce B. Downs in new Tampa. Sometimes bike rides can be simple pedaling close to home -- not 46-mile rides to Flatwoods county park. Sometimes it's fun just to bike down Hillsborough Avenue and catch the signs. I see this fella all the time. Some friendly advice back in the 'hood. Bill Addler, owner of Revolution Bicycles (a SWFBUD member store), had an open house Friday night to show off his new digs at 4th Street North and 30th Avenue in St. Petersburg. Fine time had by all -- stop off and see the store. It's gorgeous. Folks had a good time at the open house. I have lived in Tampa nearly five years and it's embarrassing how little the Tampa city government has done to improve bicyling on the streets of Tampa. The state DOT repaved Nebraska Avenue and Tampa Street and installed bike lanes. And the city put in a bike lane for about a mile on Manhattan Avenue by the library. Bayshore Blvd. is an absolute joke for bicyclists -- there supposedly is a "plan" to fix and improve Bayshore but I'll believe it when I see it when that road is repaved and bike lanes are striped on both sides of Bayshore. St. Petersburg's bicycle and pedestrian program shames the city of Tampa, which is one of the worst cities to bike in. I've lived in and have biked across the country and seen a lot -- and when I stack up Tampa against other cities around the country, Tampa is at or near the bottom. Its public works traffic staff is nothing short of a joke when it comes to bicycling awareness. I personally spoke to three different staffers last year -- one said to bike on sidewalks, another complained about bicyclists going through red lights and the third asked me where he could buy "Trek tires." In February, Mayor Pam Iorio joined the Seminole heights Bicycle Club on its maiden bike ride and during a break along the ride promised (we have it on video) to put in a bike lane along Platt Street to lead cyclists from South Tampa into downtown. Platt Street is wide and a one-way main road that leads into downtown. "Mayor Iorio asked me to respond to your latest e-mail re a bike lane on Platt street. The Public Works traffic staff have done a complete evaluation of Platt from Howard to Bayshore to determine if a bike lane could be installed. They discovered that the width of Platt varies sufficiently that a continuous bike lane, meeting established safety standards, could not be installed. While there are locations that would accommodate a bike lane, it would end up being intermittent and therefore not a safe installation. Nominations have continued to be submitted and the FBHOF has continued to research various potential nominees. Below is a list of current Inductees; however, no voting has taken place. FBHOF intends to continue taking nominations and storing them in the Pending Research section of the web site or by placing the nomination under one of the below listed categories once deemed a viable nomination. Those respective nominations will remain there indefinitely for annual voting. Individuals that are voted in will be moved to the HOF Inductee section. Nominees not voted in will be maintained, updated or removed as needed. Under the section of Pending Research the FBHOF is requesting assistance from the cycling public to obtain the needed information to complete the nomination or verify information already publicly posted within the FBHOF. On a final note, various nominations that are under the respective categories are pending photographs. Thus, the FBHOF request you assist in obtaining a photograph (it is not legal to post a photograph without the persons approval). Submissions for 2008 voting are required by October 31, 2008.
he categories for nominations are not set in stone and might periodically be adjusted as needed. Pending Research - a list of potentials that require more information/research. Joan Durdahller, Dan Burden ,Herb Hiller, American Classic Corporation, West Eubank, Boston Bill, Mike Ward, Profile Racing, EJ Rogut, Hugh Moran, Willard Gibson, Joe Avalos, Ivan Franco, Ian Jackson, Dave Macook, Keith Norris, Billy Pugsley, Frank Treviso, Andy Weaver, Derrik Wilkerson, Ward Zauner, Mark Yeager, Ian Jackon, Ralph (Rafael) Clemente, Eric Peterson, Andrew, Earl Henry, Scott Crowell, Ryan Trebon, West Eubank, Joan Durdahller, Dan Burden, Herb Hiller, American Classic Corporation, Boston Bill, Mike Ward, Profile Racing. Disclaimer - BuildingChampionCyclistFL.net sponsors the Florida Bicycling Hall of Fame, which is a Not For Profit program. Any assistance, material, time or resources provided to the FBHOF are voluntarily provided with no obligation from FBHOF. There are no exceptions to this policy unless there is a written compensation agreement in advance of provision of the services. "When you're stuck sitting in a comfort zone, small problems become magnified. downhill road about halfway into the 34-mile bike portion of the event. off the ventilator and die. wanted to take, as did Barbara's two adult daughters and her doctors. about it," Tom said. "She had her mind made up." 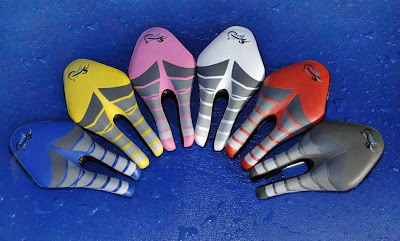 7.2-mile swim, 336-mile bike and 78.6-mile run. comfort zone, touch the edge, and you come back with an appreciation for life." said more than anything Barbara Warren was a role model. Born in Austria, she moved to Florence, Italy, in her late teens to study art. She became a model, appearing in Harper's Bazaar and Vogue, according to Drake. She moved to Mexico and acted in films. "She was mostly a villain," Drake said. Diego, Warren studied to become a psychologist. second Ironman Triathlon World Championship. "There were no shortcuts." Carlsbad remembers Warren for her kindness. Like Warren, Jones is a twin. "She always asked about my sister," Jones said. "She understood the bond." beside her, touching her head. Drake lay beside her sister when she died. "My heart and my soul are gone," Drake said. "She was everything in my life." All are welcome to a Walk, Run, Bike event on Saturday, October 4 at 10 a.m to celebrate the completion of the Pinellas Trail into downtown St. Petersburg . The event will start at the trestle bridge at the northwest corner of Tropicana Field and continue to Pioneer Park at Central Avenue and Beach Drive. Activities will include bike registration, helmet fitting and safety information. The event also coincides with the opening day of Saturday Morning Market which moves to the Al Lang parking area across from Pioneer Park this year. More details to follow! I'd like to welcome longtime Tampa bicycle store University Bicycle Center -- known as UBC around here -- as the lastest retail bicycle shop to join SWFBUD. South West Florida Bicycle United Dealers is a group of seven Tampa Bay area bicycle shops committed to growing bicycling together by joining forces and advocating for improved conditions for area bicyclists. I spoke at length this week with Manny Mirabal, whose family has owned UBC since 1972. Manny is committed to working with SWFBUD bike stores to get more people on bicycles, lobby our local governments to commit more resources for improved roads and trails and make the Bicycle Bash by the Bay the premier bicycle event in the area bringing together Tampa Bay's diverse and rich biking community. Look for Manny and UBC at this year's Bicycle Bash by the Bay, which is set for 11AM-4PM at Vinoy Park in St. Petersburg on Oct 19, right after the Share the Road Ride, which is set for 8-11AM. If you want to be a vendor, please contact alansnel@yahoo.com. The cyclists with the Share the Road Ride will have $5 meal tickets to redeem, so if you are a food vendor, you will have a chance for a lucrative day at the Bicycle Bash by the Bay. TAMPA -- A man was shot early this morning after confronting three people that he suspected of stealing his bicycle. Robert E. Brown was shot in the shoulder by Darrielle Williams, police said. About 1 a.m., Brown was watching TV with a friend at 1405 E Palifox when they discovered that their bicycles had been taken from the front yard. They saw three men with the bikes on N 15th Street and confronted them. Williams later admitted shooting Brown, police said. He had hidden the gun beneath a car parked at 1508 E Ida St.
Brown was in stable condition at Tampa General Hospital. The other two suspects got away with the bicycles. Cheryl Stacks, the city of St. Petersburg's bicycle-pedestrian coordinator, was on her way to a Pinellas County Bicycle Advisory Committee meeting this week when she saw the Bicycle Bash by the Bay sign on a PSTA bus. Thank you Cheryl for snapping the photo and SWFBUD thanks to Ryan at PSTA who designed the sign. Job well done! For regular readers of Bicycle Stories, you might recall a little pledge I made back in June that if the Tampa Bay Rays clinch a playoff berth after a decade of historic losing ways, I would ride 100 miles on the day after the berth-clinching day and hit as many Dunkin Donuts stores as possible along the way. That's because you can get a free donut at any Dunkin Donuts store in the Tampa Bay area the day after the Rays win a game. And with the Rays sporting the best record in the American League these days, that's quite a few Boston cremes, double chocolate and jelly donuts. So I crafted a bike route that would include 13 Dunkin Donut pit stops along a 100-mile ride that would go from my house in Seminole Heights to the Trop in St. Petersburg. Jack Sweeney the famed Ghostrider had some time on his hands, so he fashioned the ultimate in urban pedaling/recycling. 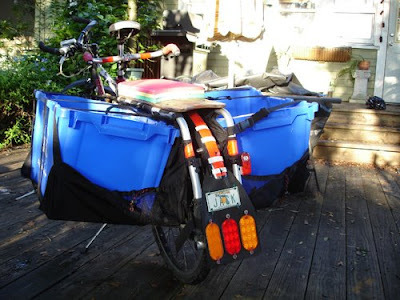 Read how Jack equipped his Xtracycle with a pair of big ol' blue recycling bins. I bet Mayor Pam would be awfully proud. 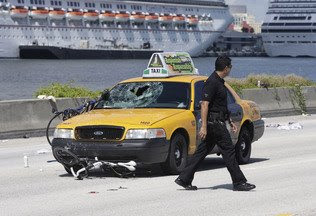 Eleven cyclists on a leisurely Sunday morning ride were plowed down by a cabbie as they rode east on the MacArthur Causeway near the Palm Island entrance, Miami Beach police said. For the rest of the story, read here. As fellow Seminole Heights cyclist Alan Badia who sent me this item put it: "Our state continues to be a dangerous place to ride bikes. Check out the photo. Could be any one of us on any given day." For more outrage, check this out. Bob Gibbs has not taken his 2004 diagnosis of a brain tumor lying down. He traveled all the way to UCLA for surgery, and to enroll in a clinical trial for a brain tumor vaccine. Now, in addition to his personal fight, he wants to raise awareness of brain tumors and further research into this deadly disease. 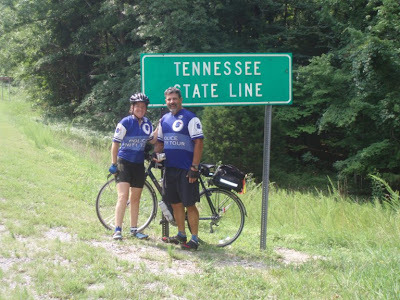 Together with his wife, Barb, they came up with the idea for “Miles for Hope,” the first annual charity bike tour to support brain cancer research. Sponsored by PureSport Sport Drinks, Miles for Hope (MilesForHope.org) will take place on Saturday, September 28 and include 100k, 50k, and 10k routes that have been carefully chosen for safety and enjoyment. The tour will begin at Joe Dimaggio Sports Complex (2450 Drew St., Clearwater), and routes will be fully supported by dedicated volunteers. Snacks and drinks will also be provided and rest stops will be available throughout. All cyclists, advanced to beginners, can register for the ride by visiting www.MilesForHope.org or on the day of the bike tour. Registration is $40 and includes an event T-shirt, lunch after the tour, and a “goody” bag. Check-in begins at 6 a.m. The funds raised this year will go to the expansion of brain tumor research. The brain vaccine at UCLA, developed by his neurosurgeon Dr. Linda Liau, uses cells taken from the tumor after it is surgically removed. Currently, the trial only takes patients with Grade III and IV tumors (tumors are graded from 1 to IV depending on their severity). But the Gibbs hope to expand future trials with the money they raise to allow people with Grade II tumors, as well as pediatric patients, to also participate. There are over 120 different types of brain tumors which makes effective treatment complicated, says Barbara Gibbs. "The general public remains unaware of the magnitude of the disease," she says. "Dealing with the symptoms and deficits that a brain tumor causes can be difficult, but when you add no hope for a cure, that makes it that much more difficult." "With others who are joining us in our cause, it is our goal to raise at least $200,000 collectively thru this event," says Bob Gibbs. “No donation is too small, because every dollar brings us closer to aid in finding a cure for this otherwise terminal disease." Tax deductible donations are also accepted. A recap of the first annual Miles for Hope Charity Bike Tour will be sent to all sponsors. For more information please contact Bob or Barbara Gibbs at 727-647-6548 or by email at info@milesforhope.org. Some guys are a bit too enthusiastic about their bicycle collection. When storms hit and roads are closed or powerlines are down, I find using a bicycle is the best way to get around. For example, check out this bicyclist getting around a flooded street in Melbourne. PITTSBURGH -- It's being dubbed "The Ride of Your Life", and it's the brainchild of local entrepreneur Gene Nacey, one of Pittsburgh's past "Entrepreneurs of the Year". Eight individuals and two alternates, half men & half women, from 16 to 66 yrs. old and at least 25 to 50 lbs overweight are about to do something seemingly impossible. In just 6 months, despite never having participated in a cycling event of more than 15 miles, they will be officially entered as part of a cycling team, competing in the hardest race on U.S. soil, the Race Across America, from California to Maryland, in just one week's time. "We're calling them 'Team Re-Conditioned', since we will be taking completely de-conditioned, ordinary individuals, and helping them transform into true athletes. We are making the point that anyone can do this, with the right training and desire," said Gene Nacey, Coach & Manager for Global Ride, LLC. To raise the stakes even higher, they will also have $2,500 of their own money on the line. If they miss too much training, or don't lose enough weight, they will lose their $2,500, and one of the eager alternates will take their place. There are no refunds for any reason, including health problems. There are no excuses here. 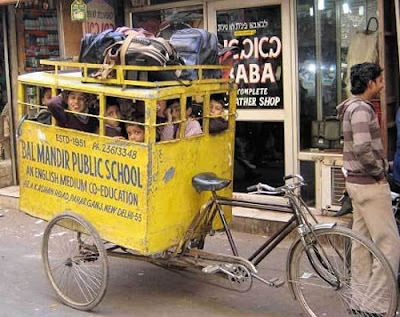 Physically, mentally and emotionally, this will be The Ride of Their Lives! In the process, each team member must raise $10,000 in charitable contributions for the charity of their choice. They must also be accountable daily for their workout regimen, as well as everything they eat. To help with this, they will recruit a "Personal Champion" who will take point on the fund raising, and review their training and food consumption on a daily basis. They must do all of this without taking off any work or shirking any family responsibilities. In other words, they must pursue an extraordinary accomplishment, within the same constraints that they are under right now. The difference now is they must find the grit and determination to make it happen this time. They have to want it, and want it badly. "This is exactly the kind of challenge I need to finally change and become the person I've always wanted to be. I see these guys out riding, and training at the gym, and all I see myself doing is starting and stopping. I can't seem to keep it together long enough to make it work. This time it's going to be different. This is the structure and end goal that will keep me working hard till I get there. I can't wait to start!" said Brian Krainbucher, team member for Global Ride's "Team Re-Conditioned". This monumental effort will be led by experts in the field, and supported by a cast of professionals at Global Ride's Training Center just outside of Pittsburgh, PA. On the line is much more than money. It will be an accomplishment they will never forget, harder work than they ever realized, but personal growth in every area except for their waistline. Applications for becoming a team member or an alternate are still being taken. Interested participants should go to http://www.globalride.net, and click on "The Ride of Your Life". 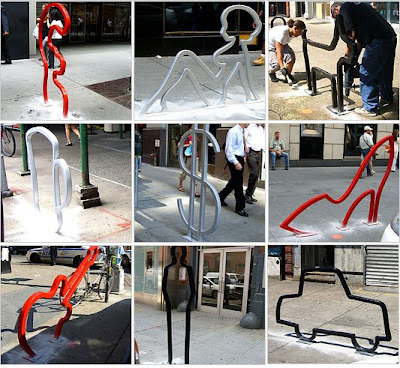 Musician David Byrne who happens to love bicycling has combined bike racks and art with a nine bike racks around New York City. In summertime in Florida, I bike very early in the day and end up watching way too much TV when storms and lightning and heavy rains take over the rest of the day. Here's my Top 10 things about TV that have caught my attention. -- Former Major Leaguer Brian Anderson was incredibly good as the color commentator during Rays games on FSN during a recent 10-game road trip in Seattle, Oakland and Texas. Anderson was pinch-hitting behind the mike for regular commentator Joe Magrane. Anderson was chatting as if he was hanging out with you while watching the game, cracking jokes while dropping in some expert observations. -- ESPN's coverage of the Little League World Series/16-team tournament in Williamsport, PA creeps me out. I don't like big-time announcers, including former big leaguers, breaking down the swings, throws and pitches of kids who are only 12 and 13. The game coverage parrots MLB broadcasts and they're totally out of place given the emotional maturity of your average 12-year-old, who cries after getting beaten in a big game. -- One of the most bizarre TV shows is on truTV where a bunch of wacky-looking repo guys and gals show up with a pick-up truck and a winch and stage confrontational showdowns with the car owners, who aren't exactly too pleased about losing their vehicles. -- Here's a tip for you future grooms. Watch a few episodes of a wild TV show called Bridezilla on the WE network. -- The roasts of B celebrities such as Bob Saget are outrageous on Comedy Central. -- Do you think NBC showed enough U.S. women's beach volleyball during the Olympics? -- My favorite sport to watch during the Olympics that I never see the rest of the year (or for four years): badminton. Those players are just wailing at the shuttle and the rallies last a pretty long time considering how hard they're slamming that sucker. -- It seems like the political ads are pretty tame so far. I guess the goofy/mean-spirited rhetoric will be cranked up by October. -- Watching the Rays win and hang onto first place in MLB's toughest division through the summer is a bit surreal, but I have to admit I just cringe when I watch a major leaguer with terrific ability like B.J. Upton jog around the bases instead of turning on the jets right from the get-go out of the batter's box. I played baseball in high school and college, so I know how truly difficult hitting and throwing that baseball can me. But the easiest thing to do is just run -- and run as hard as you can all the time. Is that asking too much? -- When TV weather predicters tell you that a hurricane is coming to your town and all you get is a steady breeze and a bunch of clouds, it breeds complacency among the masses when hurricane chatter crops up on the tube. I know the TV people are not intentionally crying wolf because nobody has a crystal ball when it comes to Mother Nature. But people begin to tune out hurricane talk when you talk about one and it doesn't actually happen. This morning I awoke to cloudy skies but not rain. So I got the bike up and going and did a quick 24 miles. The days leading up to today was hyping Fay as a potential hurricane that would rake the west coast of Florida, including the Tampa Bay area. But the storm has moved more east and looks like it's going to head up north along the central spine of Florida instead the coast. It was breezy out of the east but as of 9:37 a.m. still no rain. The school districts in the Tampa Bay area have cancelled school. Buses sit idle on 22nd Street as I head out for a bike ride this morning. Rowlett Park Drive was mostly quiet. I'm sure the drenching is coming -- it just didn't happen while pedaling this morning. Fay is fickle -- hmmm, now I understand why nature is refered to as a female. Hey fay, I know you're out there. Here's a CNN report about a disturbing road-rage case in California where a driver was charged with stopping purposely in front of two cyclists, who were hospitalized after smashing into the back of the car. This morning I cycled to Flatwoods under pleasant weather conditions and it was hard to believe that all hell -- (weather wise) is expected to break loose in about 36 hours are so. That's when Fay is supposed to come to town here in Tampa. This morning the SHBC did our Davis Islands ride, drawing about 17 cyclists. Most were on road bikes, but hard-core week-in, week-out riders Wes and Fay brought their bigger fat-tire bikes and did an abbreviated version of our 22-mile Davis Islands ride. The SHBC is trul Biketown USA -- people who love cycling but who don't take themselves too seriously. It made for a terrific ride. Heading down North Boulevard to downtown Tampa and downtown Tampa. Fixed gear and recumbent bikes joined the fun. That's the Big M on the recumbent. My fellow blogging brother Jeff Houck of the always hilarious sidesalad.net offered up this tasty morsel of a bicycling story. 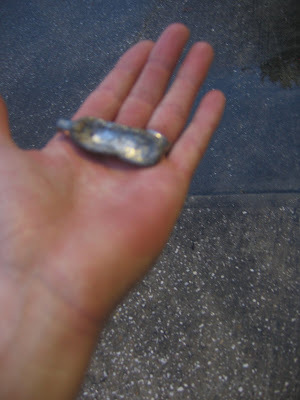 Tampa bicycle commuter Tyson Dabney tells me that he finds empty co2 cartridges on the side of roads around here. I'm old school, so I use my bike frame pump to inflate tubes when I get flats. But I know many road cyclists do deploy the co2s. So if you do, take the spent cartridge and dispose of it properly -- as in not on the roads. Litterbugs are not cool. Here's Tyson's report and he sent the photo above. "As a bike commuter i get on the streets of tampa daily and I've been noticing something that makes me, as a cyclist, cringe. explanations but I find most unlikely." As you know, drivers are required to give a bicyclist three feet of buffer space when they pass them in a car. So this fella has the right idea to enforce that law -- a three-foot wire sticking out with a flag at the end. While he probably won't have to enforce the 3-foot buffer law on the ol' Flatwoods loop, it's a nice device for the roads around here to make sure drivers comply with the law. I want to introduce you to Matt, owner of the Tour de Pizza shop in the Publix shopping center at 38th Avenue and 4th Street N. in St. Petersburg. Matt said he's going to be a vendor at the Bicycle Bash by the Bay on Oct. 19 and is a big bicycle supporter. Matt inherited a few fun bicycle decoration leftovers from Revolution Bicycles whe that store moved to its new stand-alone building near Matt's pizzeria. Matt and his wife came from Denver, where he ran a pizza shop near the University of Denver. Stop by and say hi to Matt. The exact address of Tour de Pizza is 212 37th N. and he can be reached at 727-642-7570. 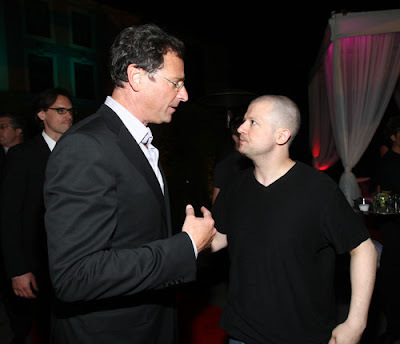 Also visit a web site at www.fightforever.org -- it'll give you some background on why Matt started the pizzeria. Am I the only person who doesn't listen to music through ear cords while cycling at Flatwoods county park? I know the world can be a pretty hostile place and tuning everything out offers a safe refuge, I suppose. But folks who can't hear anything on the paved loop where other bicyclists are advising them that they're coming up on their left are putting themselves and others in a potentially perilous situation. Sometimes it's just plain safe to keep the cords out of your ears and be able to hear what's going on at the Flatwoods loop. I never wear anything that is going into my ears when I bike. I love listening to the whoosh of the air or a hawk or just chatting with folks while cycling. My ears are the eyes behind my head. The Bucs Bicycle was in display at Fun-Lan market, where you can always find an interesting bicycle. Like this one this morning. I biked my bread-and-butter route to Flatwoods this morning and while on the Flatwoods loop I met TNT. I thought TNT was a TV network but it's actually also a bicycle group called "Team New Tampa." I tried saying hi to the cyclists in TNT but none of them swapped a hello while they pedaled their pace line. I guess they were too busy training for next year's Tour de France. The Seminole Heights Bicycle Club is a wonderful Biketown success story -- everyday folks biking in regular shorts and T-shirts around the streets of our neighborhood. We did it again this morning, doing the 10-mile "River Ride." We had 17 cyclists -- folks on road bikes and mountain bikes and hybrids -- and we enjoyed the comradery and local roads. My cycling pal Ellen spent the week in Kentucky and was cycling the rolling hills of the Bluegrass State. City of Tampa, Are You Listening? BE IT FURTHER RESOLVED, that the U.S. Conference of Mayors encourages every mayor to strive to make their city a Bicycle Friendly Community. SWFBUD gets involved. We blew the whistle on a developer who built a traffic median into a bike lane on Fletcher Avenue near the Telecom business center last year. The median was removed. We put on the Bicycle Bash by the Bay, a bicycle festival which drew several thousand people last fall to celebrate and advocate cycling. And we lobbied the Hillsborough County commissioners to allocate CIT funds to build a connector trail that would link the Upper Tampa Bay Trail with the Suncoast Trail to create what would be the longest continuous paved trail in the state of Florida. I was in front of the county commissioners yesterday afternoon explaining that we need both bike trails and bike lanes on roads, and that trails make our county a better place to live, that the DOT would reimburse the county for the lion's share of the connector trail costs. I was pleased to hear from John Harrison, a county trails committee member and a SWAMP member that the commissioners voted to start building the connector trail. (It should be noted that the commissioners approved $3 million for a trail head at the Hillsborough entrance to the Suncoast Parkway bike trail. The new trail head is needed because the current parking lot will be removed when the entrance ramps for the Veterans Highwat are built near Lutz Lake Fern Road, according to the St. Petersburg Times). "GREAT NEWS!! The commissioners voted to start the trail with money from the CIT fund at today's Public Meeting. "They allocated money to start the C-1 section of the trail on Lutz-Fern Lake Rd. This is the first section in the plan. Details will be forthcoming but I just wanted to let everyone know the result of all your letters. "You made a difference. Special thanks to Alan Snell and Deborah Voiles who also presented this afternoon at the meeting. Thanks again, more details will follow in a few days. 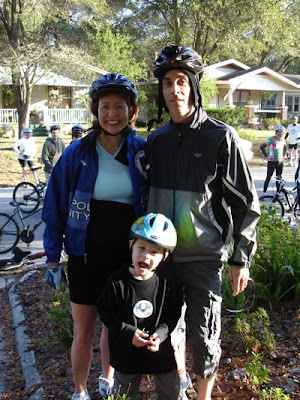 The 2008 Bicycle Bash by the Bay has a co-sponsor: The city of St. Petersburg. The rain has added a nice visual touch at Flatwoods off Morris Bridge Road the last few days. Bennigans may have shuttered its doors without notice, but its lovely fountain at this restaurant on Bruce B. Downs Blvd. in new Tampa is still working.